It was December, 1944 when the Battle of the Bulge started in World War II. Germany launched its last big offensive against the surging allied armies which had landed in Europe on D-Day. While this massive battle unfolded, another war was also taking place in Europe, a war against hunger and famine. Hunger was everywhere. At Christmas time, a Belgian father published an open letter to General Eisenhower and the American soldiers. He thanked them for sharing food from their ration kits with hungry Belgian children. At nearly the same moment in Finnmark (northern Norway) the Allies were rushing humanitarian aid to help those left homeless and hungry after the Nazis burned the region while in retreat. The charities American Relief for Norway, the Red Cross and Save the Children also came to the rescue of Norway for emergency aid and reconstruction. The Netherlands, occupied by the Nazis, was entering what is known as the “hunger winter” of 1944-1945 as it waited for liberation. In December of 1944, General Dwight Eisenhower issued orders for relief supplies to be built up and ready to distribute in the Netherlands as soon as liberation took place. The Battle of the Bulge caused such suffering that food supplies had to be diverted to Belgium to feed the hungry there. The Netherlands’ supply had to be built back up. As the war continued into early 1945, conditions deteriorated in the Netherlands with people dying from starvation. In April of 1945 the Allies reached agreement with the German occupiers to begin airlifting food supplies into the Netherlands. Truck convoys of aid soon followed. Germany surrendered in May 1945. The famine in the Netherlands would have claimed far more lives if the Allies had not stored enough food supplies to enact a huge relief operation. Hunger relief continued long after the guns fell silent in World War II. One lesson learned from World War II and the Battle of the Bulge was that even under the most difficult of circumstances, the most destructive war ever, the U.S. and their allies were able to keep up a fight against hunger and save lives. 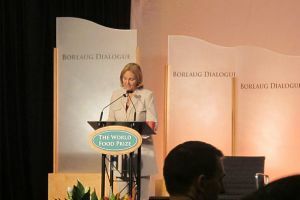 The humanitarian effort displayed in behalf of the suffering victims of World War II provides an excellent example for present leadership to follow, as hunger continues to be the deadly companion of conflict and poverty around the globe. This is tragically evident in many countries today from Sudan to Afghanistan, Yemen, Libya and other crisis points. The United Nations World Food Programme, directed by Josette Sheeran, feeds war victims in these countries daily. Josette’s father James served with the U.S military in the Battle of the Bulge and contributed to post-war hunger relief in France. Article first published as The Battle of the Bulge and Fighting Global Hunger on Blogcritics. This year’s chaos in Yemen has made it much harder for these children to gain access to needed foods. Lack of nutrition for children stunts physical and mental growth. WFP is feeding displaced persons in Southern Yemen and also in the North, where years of conflict have left nearly half a million people struggling in hunger and poverty. Nationwide, WFP is running a safety net operation to reach nearly 1.8 million Yemenis impacted by high food prices. However, low funding has severely limited the reach of this mission. WFP relies on voluntary funding from the international community. Sheeran says that “WFP food assistance provides vital nutrition and stability at a time of great need.” If the program becomes fully funded, more Yemenis can be reached. While Yemen is immersed in hunger and instability, the U.S. Congress is proposing reducing international food aid programs as part of budget cuts. The savings will be minimal and the consequences disastrous. Food aid programs currently make up less than one tenth of one percent of the federal budget. Hunger and malnutrition are silent, but are so powerful that they can devastate a population within weeks if left unchecked; or they can slowly weaken the people through prolonged malnutrition. Yemen is caught in this trap. The international community has to act now to put in place the safety nets which can save Yemen from hunger and malnutrition. There cannot be true change in Yemen as long as malnutrition has free reign. Article first published as WFP Director Warns of Hunger Threat Stalking Yemen at Blogcritics Magazine.